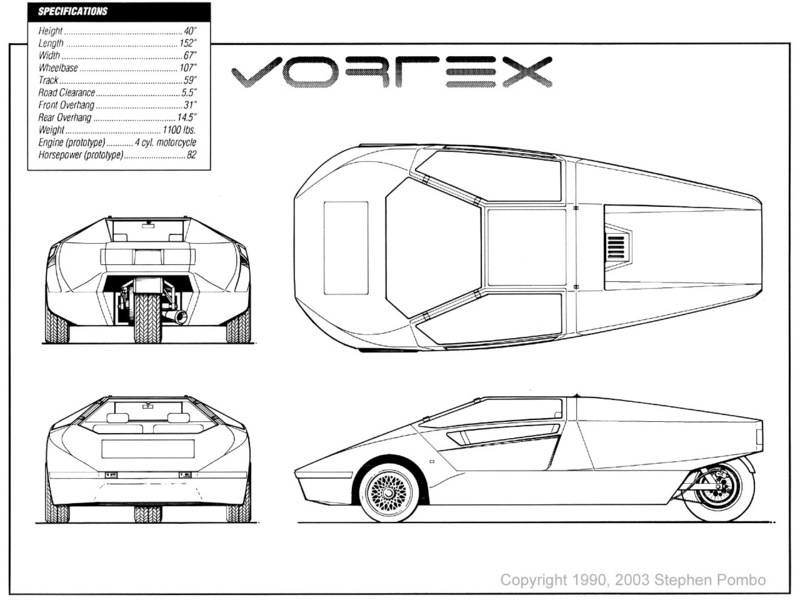 The VORTEX was designed as a "do-it-yourself" 3-wheeled vehicle meant to be built from the ground up. 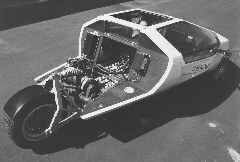 The modular chassis accepts either motorcycle or electric powerplants. 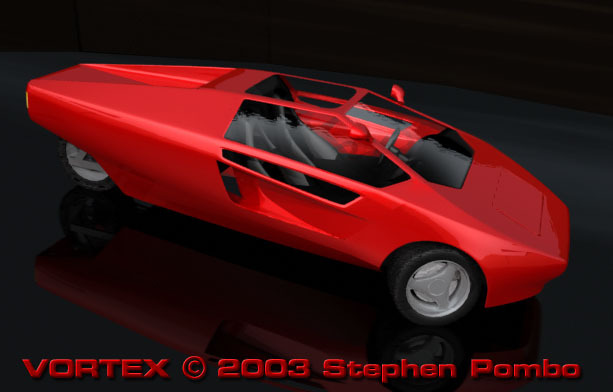 Here is an early design sketch illustrating the teardrop shape and exotic car feel. The VORTEX shape is as innovative today as it was when it was designed, 15 years ago. The VORTEX is not a kit, it is built entirely from plans . As exotic as the VORTEX looks, it was designed to be built by a home craftsman using inexpensive materials and ordinary tools. The chassis is a monocoque design made from plywood and fiberglass. The body is a composite structure sculpted from foam and covered with fiberglass, similar to many homebuilt aircraft and boats. 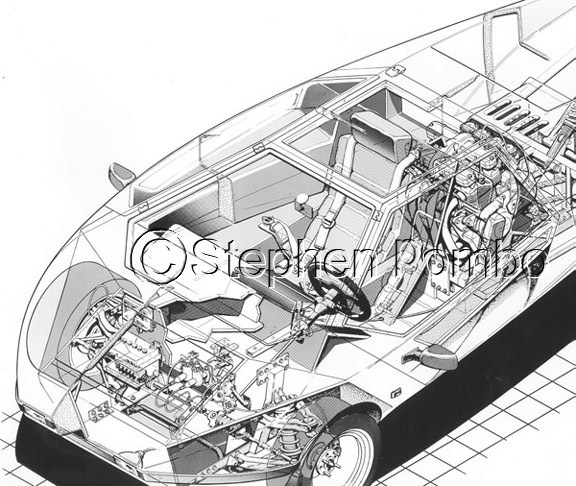 Metal subframes hold the independent front suspension components and rear drive unit. This construction technique allows you to easily customize the vehicle to your own requirements and to initiate the project with a very low monetary investment. The interior is spacious and comfortable. 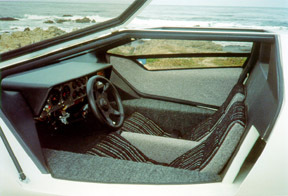 A removable sunroof makes for pleasant open-air motoring. The doors of the VORTEX open in a "butterfly wing" fashion (up and forward). The rear deck swings up allowing for easy access to the powertrain and batteries. 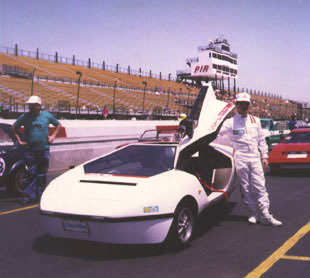 Here I am at Phoenix Int'l Raceway in 1992 getting ready to race the electric Vortex. The plans are available for the price of $90 US (includes Priority Mail 2-3 day shipping in the US. Paypal payment is available for an additional fee of $3). Contact me for details (please put "VORTEX" in the subject line). The plan set includes 12 drawing sheets (17in. x 22in.) and an extensive 8-1/2 x 11 construction manual (85 pages). Plans include instructions for Gas and Electric Versions. ALERT! THERE ARE NO OTHER AUTHORIZED SOURCES FOR THE PLANS! THERE ARE NO AUTHORIZED VENDORS FOR ANY HOMEBUILT VORTEX COMPONENTS. Copyright ©1988, 2005 Stephen Pombo All rights reserved. No part of this website or Vortex Plans may be reproduced without the expressed written permission of Stephen Pombo. 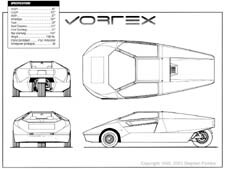 Purchase of the Vortex plans grants you permission to build ONE Vortex 3-wheeled vehicle for your own personal use. Visit 3wheelers.com for a great history of three wheelers!